Long Time Coming is an "infidelity sim" in which you've just cheated on your boyfriend, and must lie your way through an evening with him without getting caught. 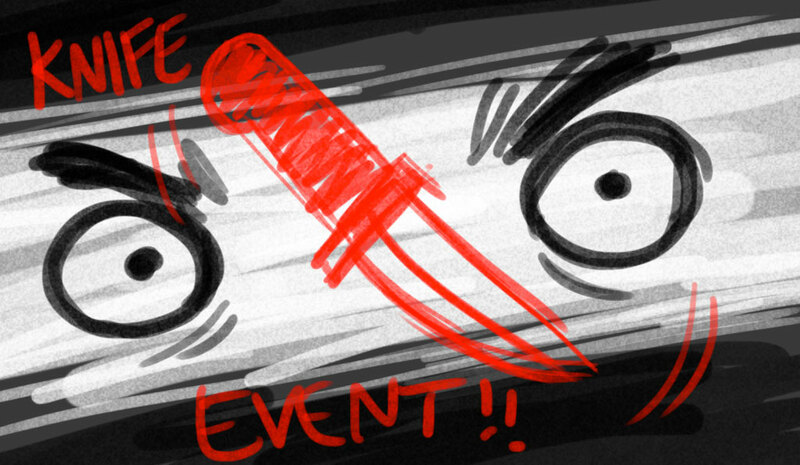 It's also an experimental visual novel which involves physically throwing knives at the screen during tense emotional situations. This game was mostly made over a single weekend for Dames Making Games Feb Fatale jam in 2013. 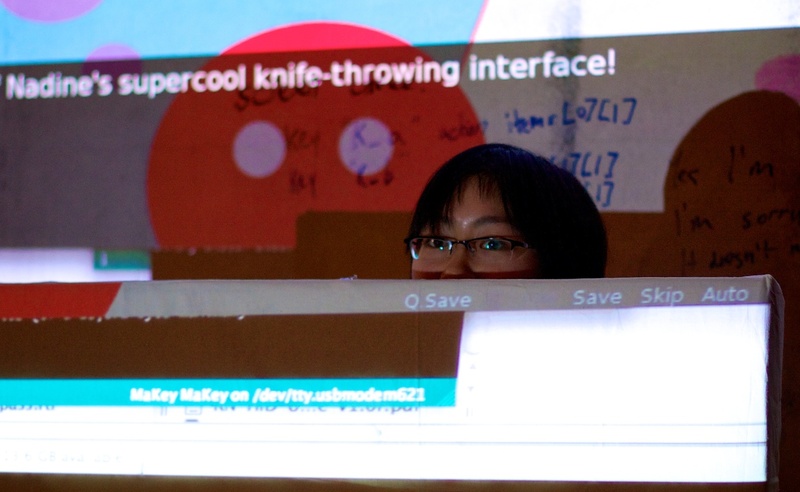 It was a collaboration between myself (Sagan Yee) and my brilliant friend Nadine Lessio, who conceptualized and implemented the knife-throwing interface. 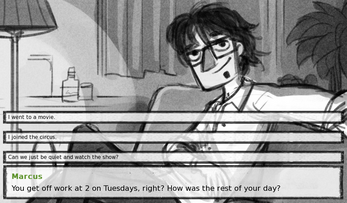 I built the game in Ren'Py (with crucial coding help from Christine Love) and did the writing and art. 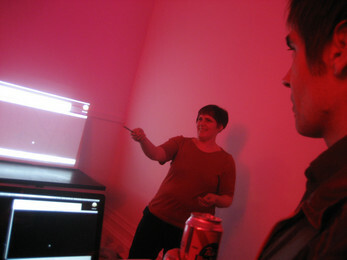 HOW IT WORKS: The game is projected on a special white board resembling a painter's canvas. Inside the board are two layers of tinfoil, separated by a foam mat. The back layer of foil is connected via alligator clips to a Makey Makey, a fun Arduino-like device which allows any conductive material (including bananas, water, and human flesh) to simulate a computer input such as mouse click or keyboard press. 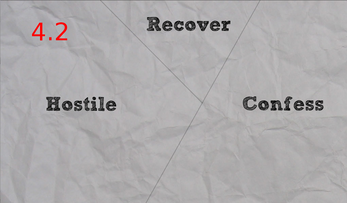 Most of this is invisible to the player, however, who can fully control the game at a distance using a laptop. Most of the game is a fairly typical visual novel, involving clicking on branching dialogue choices to try and weasel your way out of the situation. However, if your lies don't match up or the boyfriend says something particularly inflammatory, the game will switch to "Knife Mode" and you are presented with three targets: Confess, Recover, and Be Hostile. Each of these targets is mapped to a different letter on the keyboard. At this point, you must grab a throwing knife and let your accuracy be a metaphor for relationship instability by piercing the target of your choice. Aim poorly, and you could end up blurting out the truth when you meant to evade the question! If the timer runs out before you hit any of the targets, you automatically Confess, and the game ends. 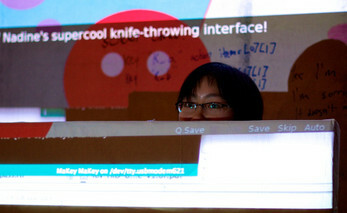 The throwing knife, once it pierces the board, acts as a "bridge" between the two layers of tinfoil, triggering the Makey Makey and fooling the computer into thinking a key has been pressed (whichever keys were mapped to the target in Ren'Py). For photos and more information on the knife board interface, see my collaborator Nadine Lessio's detailed blog post on how she made it. For more information, including design notes and "that time the cops wanted to know why we brought throwing knives to a public event", see LTC's page on my website. This game should be playable with no other installs necessary. However, in the absence of a knife board, the game can be played with mouse and keyboard. Knife Event targets will always be laid out in the form of 3 triangles. 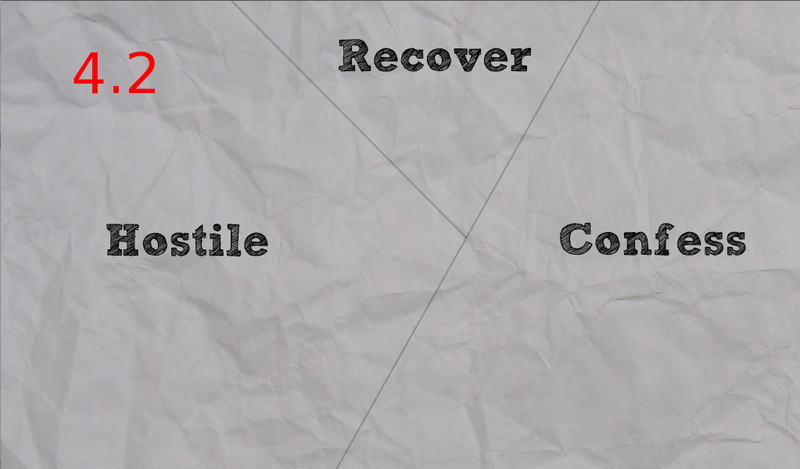 Choose the leftmost target by pressing 'A', the middle one with 'B', and the rightmost target with 'C'. Of course, this control method involves no skill whatsoever, so you can always build your own knife board if you want to play it the way it was meant to be played!